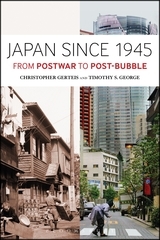 Book Announcement: Japan Since 1945 From Postwar to Post-Bubble | What can I do with a B.A. in Japanese Studies? Does Japan really matter anymore? The challenges of recent Japanese history have led some pundits and scholars to publicly wonder whether Japan’s significance is starting to wane. The multidisciplinary essays that comprise Japan Since 1945 demonstrate its ongoing importance and relevance. Examining the historical context to the social, cultural, and political underpinnings of Japan’s postwar development, the contributors re-engage earlier discourses and introduce new veins of research. Japan Since 1945 provides a much needed update to existing scholarly work on the history of contemporary Japan. It moves beyond the ‘lost decade’ and ‘terrible devastation’ frameworks that have thus far defined too much of the discussion, offering a more nuanced picture of the nation’s postwar development. This entry was posted in announcements, culture and tagged book announcement, books, bubble economy, history, Japan, modern Japan, postwar, postwar Japan. Bookmark the permalink.